Home > columnists > feature > N.Selvakkumaran > PresidentialElection2015 > Social > Appointment of the Prime Minister : Constitutional or Not? Appointment of the Prime Minister : Constitutional or Not? 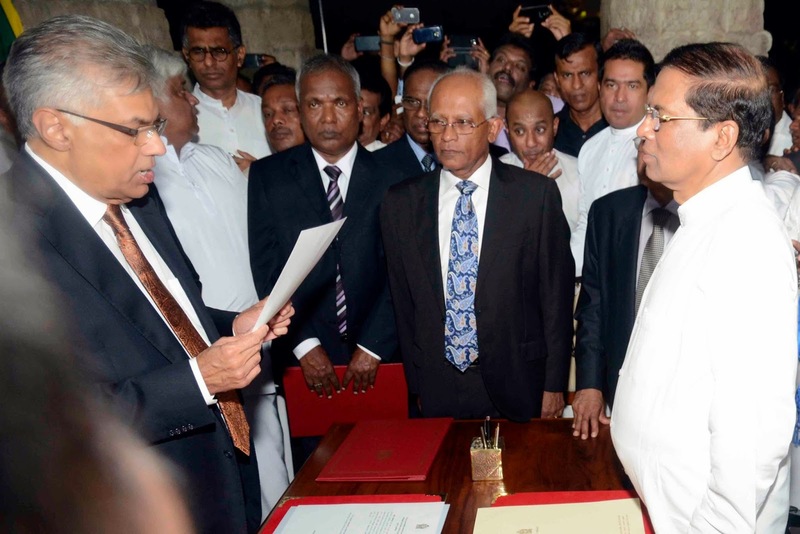 President, Maithripala Sirisena appointed Ranil Wickremasinghe as the Prime Minister of Sri Lanka on the 9th January 2015 shortly after taking oaths as the President of the Republic of Sri Lanka before His Lordship Justice K Sripavan, Judge of the Supreme Court. This appointment by the President has raised some issues amongst various quarters with regard to its constitutionality or legality. It is necessary to find out whether this appointment, which is one of the first acts by the new president, is consistent with the Constitution of the Republic. Professor N. Selvakkumaran Senior Lecturer & former Dean Faculty of Law, University of Colombo provided this analysis for the Law and Society Trust. ( January 20, 2015, Colombo, Sri Lanka Guardian) In terms of the present Constitution the President is empowered to appoint as Prime Minister the Member of Parliament who in the opinion of the President is most likely to command the confidence of Parliament [vide Article 43 (3)]. In other words, the MP chosen by the President should be capable of mustering the majority support of the Parliament. It is clear that the President should have entertained an opinion that Mr. Ranil Wickremasinghe is most likely to receive the acceptance of the present Legislature. It is immaterial, for the purpose of appointment, whether other Members, Parties or Institutions entertained such opinion or not! It is the opinion of the President that matters here. There is no express provision in the Constitution which requires a Prime Minister to demonstrate, through an affirmative vote of confidence, his or her ability to command the majority support of Parliament. However the above authority of the President is not free from any constraint, politically speaking.The President’s opinion, and consequently his act of appointing Mr. Ranil Wickremasinghe, cannot be arbitrary or based on his whims and fancies. His opinion and the appointment could be subjected to a real test within a short period. If Mr. Wickremasinghe fails to command the confidence of Parliament in the well of the House, then he cannot continue to be the Prime Minister. As mentioned earlier, although there is no provision in the Constitution which requires the Prime Minister to demonstrate his ability to gather the majority support of the Parliament by an affirmative vote, the Members of Parliament have the power, under the Constitution, to pass a vote of no confidence in the Government and thereby to cause the consequential dissolution of the Cabinet of Ministers. When a vote of no confidence is passed the incumbent Prime Minister loses his position along with the Cabinet of Ministers [vide Article 49 (2)]. Incidentally, there is an issue raised as to whether the Office of the Prime Minister was vacant for His Excellency to fill the vacancy by appointing Mr. Ranil Wickremasinghe. It emerged in some sections of the media that the former Prime Minister had initially agreed to resign from the position after the presidential candidate Maithripala Sirisena was declared victorious at the Presidential election. It also transpired that when the former Prime Minister declined to resign later on, he was removed by the President once he took oaths and thereafter he appointed Mr. Ranil Wickremasinghe as the Prime Minister. Therefore, the appointment of Mr.Wickremasinghe as the Prime Minister by the President is constitutional. If, for instance, the Parliament were to pass a vote of no confidence in the Government and thereby Mr. Ranil Wickremasinghe were to cease to be the Prime Minister in the near future, that will not make the President’s act of appointment unconstitutional. All what it will do is to reflect poorly on the political judgment made by the President. From a comparative perspective, it is appropriate to consider the process of appointing Chief Ministers in the Provinces. According to the Constitution, the Governor of a Province is empowered to appoint as Chief Minister the Member of the Provincial Council who in the Governor’s opinion is best able to command the support of a majority of the Members of that Council. However this discretionary power is constrained under the following scenario. That is where more than half of the Members elected to the Council belonged to one political party, the Governor is under a duty to appoint the leader of that political party as Chief Minister; in such a case the Governor does not enjoy any discretion. The Governor is under a duty. This position is not made applicable to the appointment of a Prime Minister by the President under the Constitution [vide Article 154F (4)]. Having analyzed the Constitutional position, it is relevant to consider the political legitimacy of the appointment of Mr. Ranil Wickremasinghe as the Prime Minister. In this respect, the candidate Maithripala Sirisena made it very clear in many political platforms and through media interviews, during the period of canvassing, that he would appoint Mr. Ranil Wickremasinghe as the Prime Minister once he won the presidential election and took oaths as the President of the Republic. He had kept to his word to the people of this country and therefore the act of appointment made by the President commands political legitimacy and acceptance from a majority of voters who participated in the presidential election. It is up to the Prime Minister Ranil Wickremasinghe to demonstrate to the country that the President’s opinion over the former’s ability to command the majority support of Parliament is not misplaced or misconceived.